One of my favorite things about living in the Midwest is that there are so many cool cities within easy weekend roadtrip distance. I love to travel and explore new cities- especially the food and shopping. So, to say I was excited when the Visit Milwaukee team invited me on a press trip tour is an understatement! We spent a few days getting a head start on Christmas shopping and eating & drinking our way through all of the best spots. 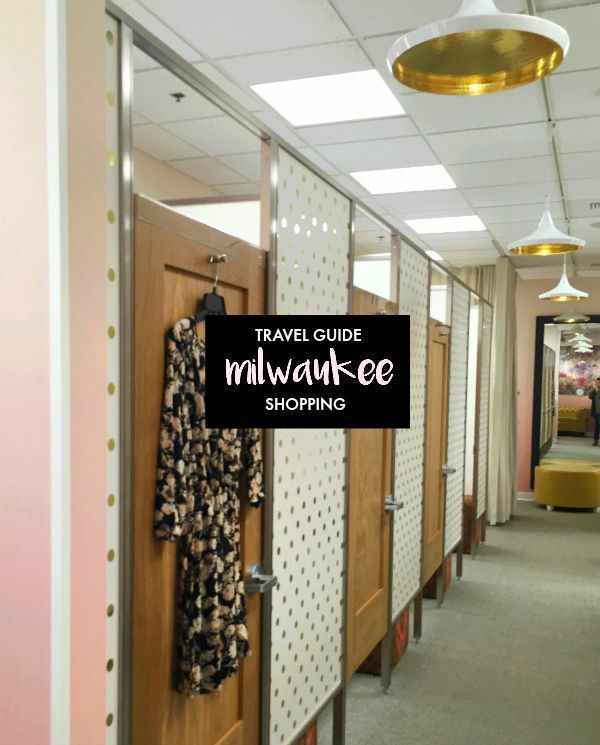 I'll kick off my travel guide to Milwaukee by highlighting all of the best shopping in downtown Milwaukee & neighboring Wauwatosa. Whether you're looking for designer goods, locally made gifts, or sweet treats, there's something for everyone. Don't worry the foodie guide will becoming up next- because of course, it's Wisconsin! Mayfair Mall in Wauwatosa has been seriously upping it's fashion game in the last couple of years. It has a great selection of stores, easy parking and a stress free holiday shopping experience. They just opened a Nordstrom store which is absolutely amazing since the nearest one until this month was in Chicago. How cute is their fitting room in the photo above? We stayed at the Crowne Plaza for our trip which is only a couple minute away from these shops! If you're looking to make your home festive for the holidays check out Crate and Barrel, The Container Store, and Pottery Barn stores (hello wedding registries! ).They never fail to make me want new dishes and furniture. Mayfair Mall also has a great selection of specialty stores like Aerie, LUSH Cosmetics, Vera Bradley & a Kate Spade store opening soon! 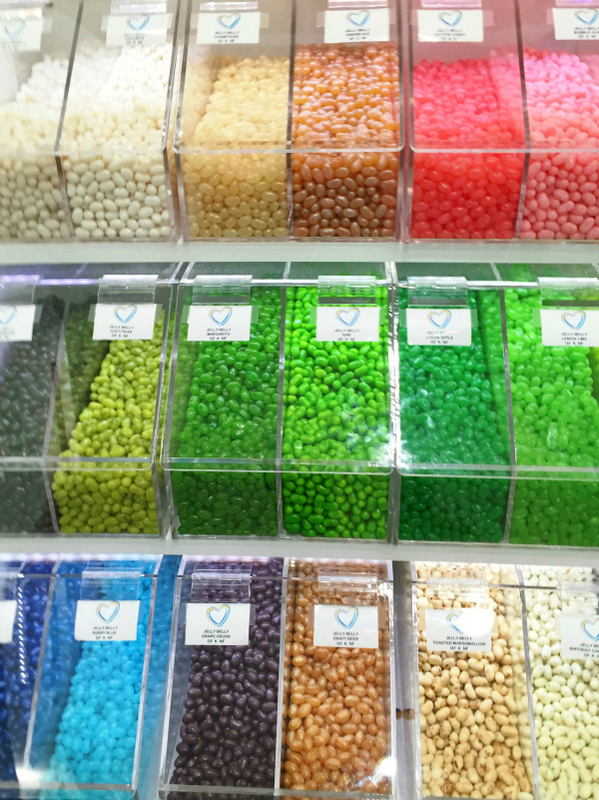 One of my favorite shops we stopped in was Get Happy, a colorful & customizable candy store. I brought Kyle home a whole bag of goodies. Drive down the road and you'll find Mayfair Collection. It's the perfect place to head if you're looking for a stylish deal. It's home to Nordstrom Rack, Off 5th, T.J. Maxx, and Ulta. Opening this week is a new J.Crew Mercantile- one of the first in the country. 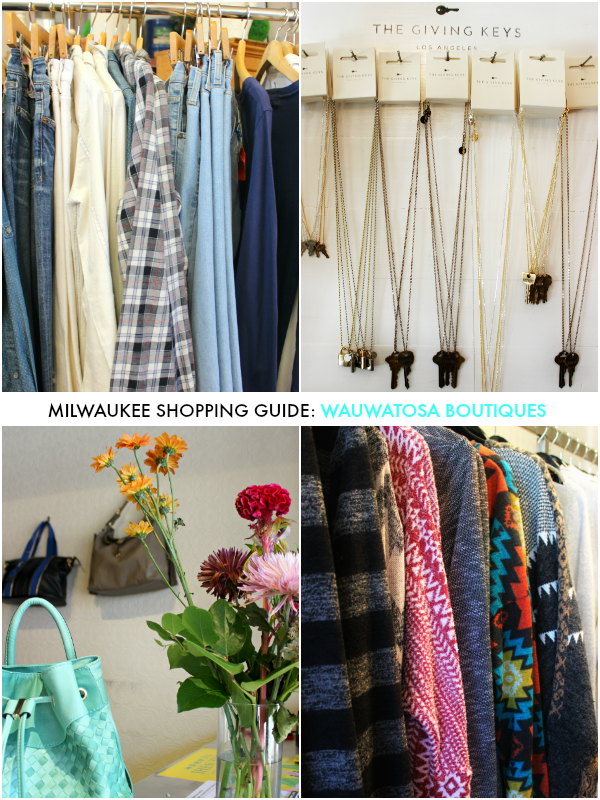 After the mall head to charming downtown Wauwatosa to shop The Village for their local independent boutiques. They have a great selection of unique items and sweet shop owners. Swing by Luci Boutique for affordable fashion finds, Soaps & Scents for stocking stuffers like bath products and candles, and Salamander for the cutest accessories and hard to find brands. I spent a good half hour in Salamander alone eyeing up their jewelry and smelling all the Capri Blue candles. 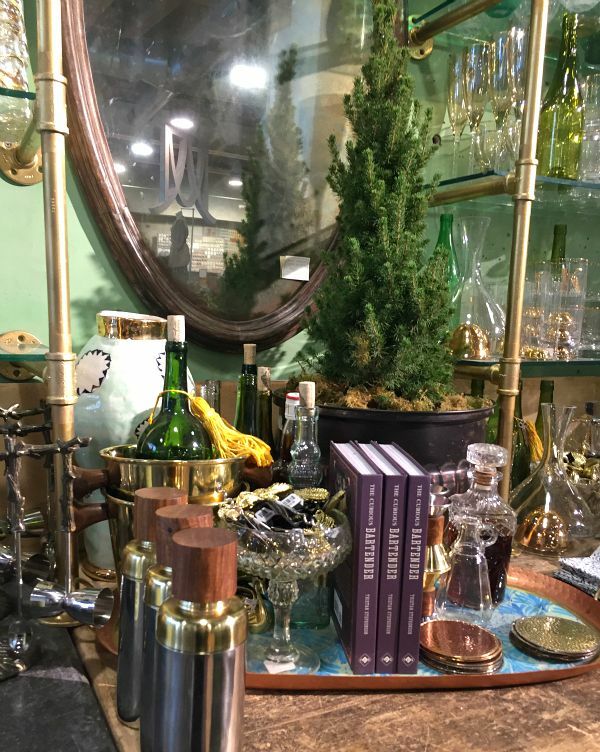 If you've never been antiquing, it's a total blast- especially since so many retro housewares and clothing are popular once again. I find it's easiest when you go in with a mission otherwise you can feel a bit overwhelmed. On this trip I was looking for mid century modern home décor, dresses from the 1950's & 60's, and vintage Christmas ornaments. 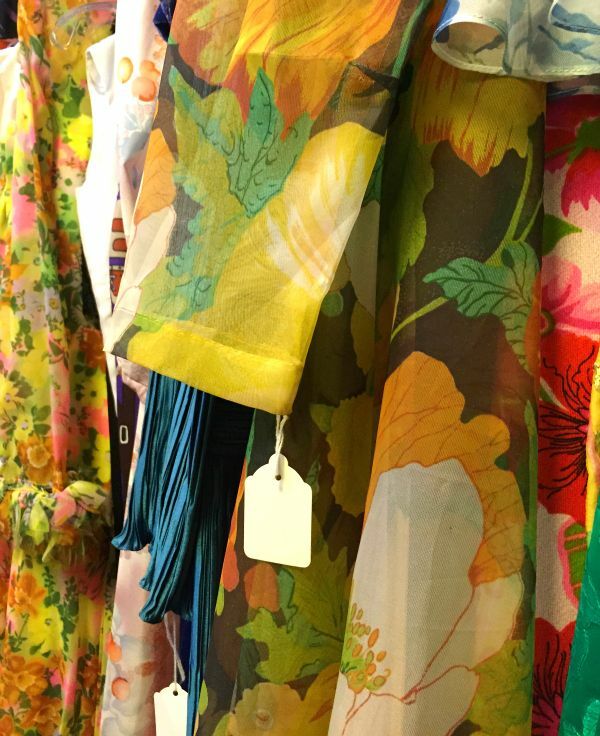 We stopped at Antique Center Walker's Point which had an incredible collection of vintage clothing and then to a newly reopened Antiques on Pierce which had a bright & airy feel and enormous selection of whatever you're on the hunt for. The Milwaukee Public Market is an incredible, bustling building filled with different vendors. It's a great place to stop if you're looking for a foodie gift like cheese, summer sausage or spices- it is Wisconsin after all! 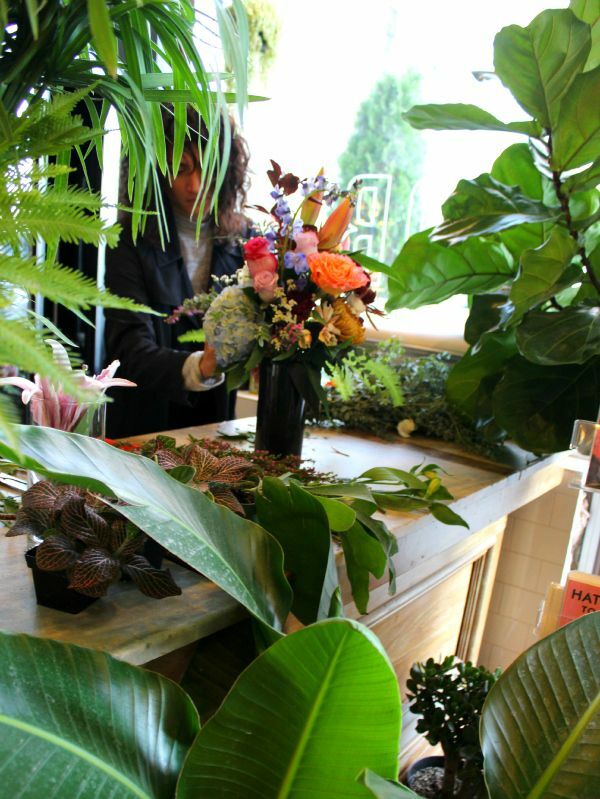 I also completely fell in love with a little shop called FORM Fine Goods & Florals and had to snap a picture of the owner making some bouquet magic happen. They had a great selection of succulents, cacti & great gifts. The Historic Third Ward is also known for it's independent boutiques. One of my favorites is Broadway Paper. 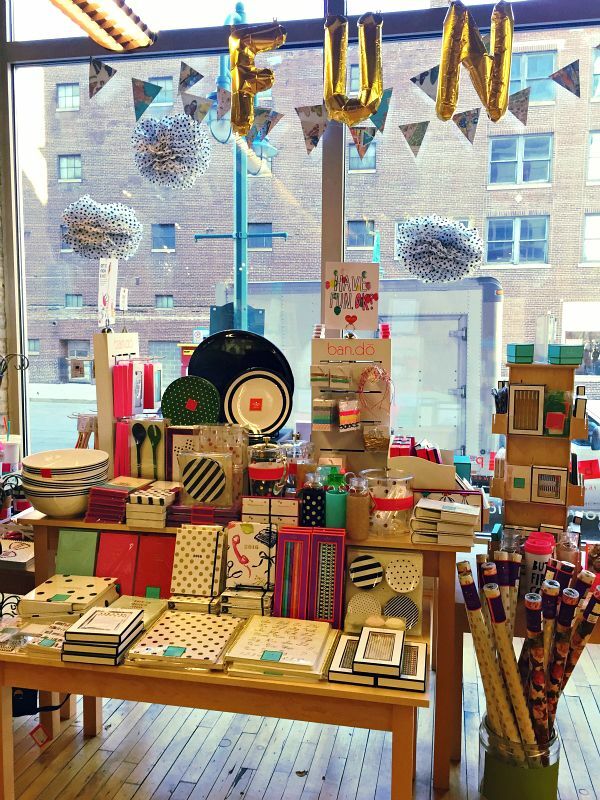 They have an amazing selection of Kate Spade, Ban.Do, Rifle Paper Co & other independent paper designers. They specialize in paper (cards, gift wrap, planners), but also have great gifts like coffee mugs, entertaining supplies & décor. Other great independent stores include Lizzibeth, filled with gorgeous affordable accessories, Inspired for home décor, and Hot Pop which specializes in eclectic toys, housewares and gifts. In addition to independent boutiques the Third Ward is home to many other beautiful stores specifically for home goods. I could spend hours in Anthropologie, Design Within Reach, and the newly opened West Elm location. Seriously, can a girl have too many coffee tables books or yummy smelling candles? Most certainly not. If you're looking to take a weekend getaway to do some Christmas shopping and some great meals, Visit Milwaukee has some really amazing hotel deals through the holiday season, local offers, and are giving away shopping getaway trip on their site. I seriously had the best time exploring the city with the Visit Milwaukee team and a sweet group of Midwest bloggers! Questions about Milwaukee? Tweet me! I'll be sharing my restaurant guide next week!